How well do 'Scarlet Paul' hawthorns take to airlayering? I removed a ring of cambium and dusted with rooting hormone and am just keeping it damp. 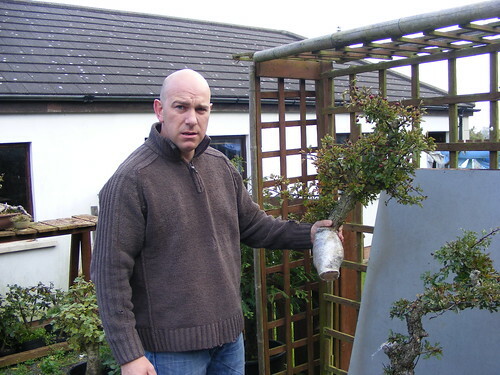 You tend to see a lot of hawthorn bonsai with white flowers, I thought I would give this cultivar a go as the red/pink flowers are quite attractive. Don't know how well they take they take to this method of propagation. Any tips or ideas would be appreciated! There was a recent thread on Paul's Scarlet and the subject of air-layering came up. I would be interested to read the replies here. I too have attempted an air-layer a few weeks ago. What I have read from various sources is that they are slower to take than common hawthorn. They say [who ever they are] that they are slower than a normal hawthorn, but I'm interested to see how yours progresses. I've been wanting to do the same, just can't find one good enough. Thanks for the replies guys! I guess we'll have to wait and see. This tree belongs to my father and he has spent several years pruning and shaping it; I could have chosen a better branch but didn't want to ruin the tree as it's not mine. I had an idea to cut off all the spent flowers to see if that would help rooting but it's not feasible as the branch is way too high. I often see this cultivar for sale grafted onto another rootstock, so perhaps it's not as robust root-wise. 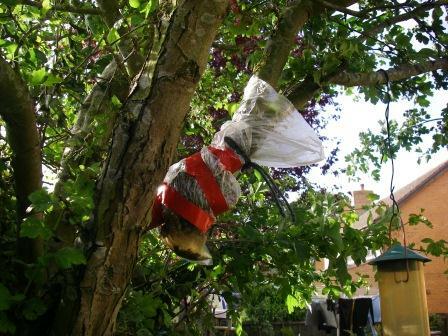 Something has been chewing at some airlayers on another tree in the garden, so I may have some work to do this week! 'They' do say that Paul's Scarlet takes longer.. and if that 'Paul' is paul.spearman then 'They' may well be correct. I too would like to air layer a Paul's Scarlet but have yet to find a suitable donor branch as they are all rather straight and with little character. Thanks for your replies guys! Paul, would you describe the method you use? There are plenty of common hawthorn available in the garden. Would now be good time to try a layer? If the Paul's Scarlet doesn't root, I won't lose too much sleep. Although, perhaps it would be possible to graft some common hawthorn whips (which spring up everywhere here) onto a branch and severe it once they have bonded over a few seasons. Here's a link that might be of interest. It's a layer on a hawthorn that I did last year. Ian Young wrote: Here's a link that might be of interest. It's a layer on a hawthorn that I did last year. Thanks for the link Ian, seems I was along the right lines. It was a good layer, cheer up! RichLewis wrote: Thanks for the link Ian, seems I was along the right lines. It was a good layer, cheer up! Hi Ian this Interweb thingy is a Dangerous tool in the wrong hands. I did a battlefields tour of France and Belgium last September. My wife, not a history person, came with and was as stunned as I was by what we saw. The War graves on both sides were beyond comprehension. Hard to smile indeed, but because of their sacrifice, we are free to smile today. Had a check under the moss today; it's forming a callous on one side and what appears to be the beginning of very small roots. Looks to be working! Found a few earwigs in there, are they likely to pose a problem? Earwigs are reported to eat plants, but I have never found them particularly voracious. The only problem is they bite. 'Paul's Scarlet' and the other named hybrid hawthorns are Crataegus xmedia. The common hawthorn is C. monogyna. It is not surprising that they behave a little differently.